This ciabatta recipe for traditional Italian bread is made the authentic way with a biga, or starter, and turns out a loaf that’s incredible on its own or in a sandwich. Before you make this authentic ciabatta recipe, understand that the dough can be tricky to handle correctly. It’s wet. Incredibly wet. It will stick to your hands. It will stick to your work surface. It will stick to everything it comes in contact with. That’s okay. Don’t add extra flour or you’ll get disappointing results. Just rest assured that, as you make the dough again and again, you’ll become practiced in how to handle it. Here, a few tips. Have a bowl of water nearby when you’re shaping the dough. Wet dough won’t stick to wet hands, so dip your hands in the water before you scoop up the dough. You can also dip your dough scraper into the water and then use it to cut the dough into 4 portions. Wet your hands before you roll the dough into a cylinder so it won’t stick as much. And then, with those wet hands, pull it into the rectangular shape. This recipe should ideally be made in a stand mixer. It can be made in a food processor. And while folks have made it by hand, it’s not recommended. (The natural inclination while kneading it is to add lots of flour to the very sticky dough, and pretty soon you won’t have ciabatta.) So just follow the instructions below. The dough will feel utterly unfamiliar and probably a bit scary. And that’s not the only unusual feature: the shaped loaves are flat and look definitely unpromising. Even when they are puffed after the second rise, you may feel certain you’ve done it all wrong. Don’t give up. The bread rises nicely in the oven. Follow the recipe. It’s written by a baker with untold experience baking bread and seeing home cooks through the inevitable learning curve that comes with handling Italian bread dough, which is much different and wetter to work with than the standard American bread dough. Trust us. When you heed her words, you’ll make it through this recipe with ease and grace—or as close to grace as you can manage when you’ve got flour smudged on your nose and bread dough clinging to your fingers. We also suggest you take a look at the comments beneath the recipe from others who, like you, were curious about trying their hand at this bread so you can learn from their collective experience, tactics, and techniques. 2. Place the dough in an oiled bowl, cover with plastic wrap, and let rise at room temperature until doubled, about 1 1/4 hours. The dough should be full of air bubbles, supple, elastic, and sticky. 3. Turn the dough onto a generously floured surface and cut it into 4 equal portions. Roll each portion into a cylinder, then stretch each cylinder into a rectangle about 10 by 4 inches, pulling with your fingers to get each portion of dough long and wide enough. 4. Generously flour 4 pieces of parchment paper placed on peels or upside-down baking sheets. Place each loaf, seam side up, on a piece of parchment. Dimple the loaves vigorously with your fingertips or knuckles so that they won’t rise too much. The dough will look heavily pockmarked, but it is very resilient, so don’t be concerned. Cover the loaves loosely with damp towels and let rise until puffy but not doubled in size, 1 1/2 to 2 hours. The loaves will look flat and definitely unpromising, but rest assured that they will rise more in the oven. 6. Just before baking the bread, sprinkle the stones with cornmeal. Carefully invert each loaf onto a stone. If the dough sticks a bit to the parchment, just gently work it free from the paper. If you need to, you can leave the paper and remove it 10 minutes later. Bake for a total of 20 to 25 minutes, spraying the oven three times with water in the first 10 minutes. Transfer the loaves to wire racks to cool. I absolutely love the crisp crust and large holes common to this Italian “slipper” loaf, so I was most excited to get started on this recipe. As I was making the very sticky “biga,” or sponge, it suddenly seemed familiar and I immediately recognized an old friend in The Italian Baker! This book has remained on my shelf while other books have come and gone several times over during the years. This bread, because it has relatively little yeast and is a slow riser, is a great Sunday afternoon side project — a Superbowl Sunday idea for those of us not glued to the game? The resulting bread has the much-desired crispy crust and soft and “holey” inside, ready to be eaten warm with some wonderful grassy olive oil or sliced lengthwise for some delicious paninis! Most of the time involved is related to hovering over the rises…and not with the actual ingredients, so it’s perfect for a cold afternoon or game day. The directions were explicit and any questions or issues along the way seem to be addressed. A winner. This recipe makes 4 wonderful loaves of bread. The instructions are letter-perfect and could be followed by even novice bakers. The dough is “sticky” but not really that difficult to handle. As warned in the recipe, my parchment paper did not release when I placed the loaves in the oven, but after a few minutes the paper pulled off easily. It was this attention to detail in the recipe that made it so user-friendly. The flavor of this bread is fairly mild because the starter (biga) is not fermented for very long. 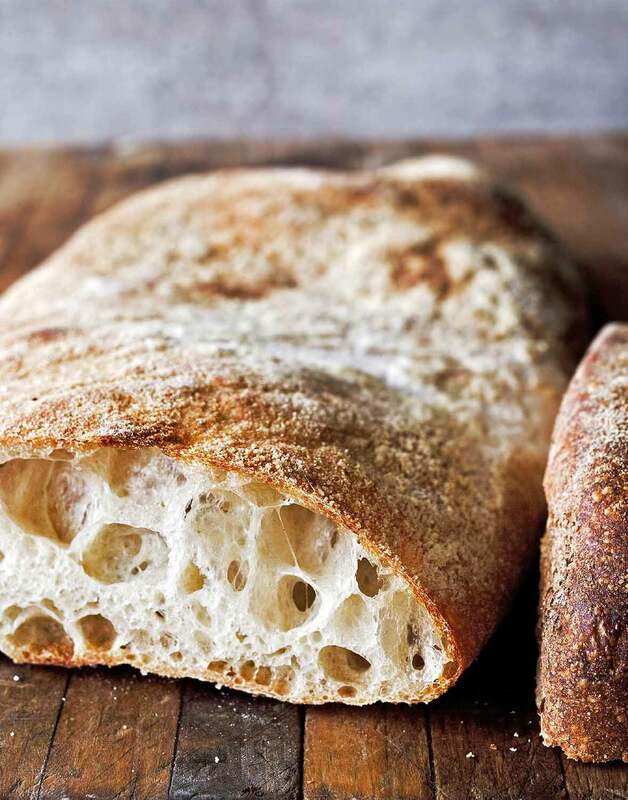 It’s this delicate flavor, enveloped in a nice chewy crust, that makes ciabatta so appealing. I will definitely be making this bread again. Probably the next time I will have the biga already made in my freezer, allowing me to make the bread all in a single day. 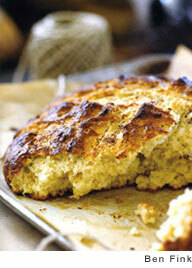 The recipe makes wonderful bread with a crisp, thin crust and an airy crumb. I could easily eat a whole “slipper” by myself with nothing more than olive oil. It’s great to see a baking recipe with weight measurements. That is what I used, and the loaves came out perfect. Note, though, that 4 of these would usually not fit on a baking stone together. I had to bake them 2 at a time, but at 20 minutes or so for the baking time, that is not such a big hassle. This brad recipe was a delight to make! I loved the feel of the dough when I was briefly kneading it before the first rise. I was initially afraid that I wouldn’t be able to determine when the dough was velvety, springy, and moist, and that I’d add too much flour. In fact, it was easy to tell when it was ready. I ran out of all-purpose flour and had to add about 150 grams white whole-wheat flour. As far as I can tell, it didn’t make much of a difference in the finished product. The loaf baked up nicely on a regular baking sheet (I don’t have a baking stone). I threw ice cubes onto a pan in the bottom of the oven to get steam. I let 1 pan with 2 loaves rise for about 1 1/2 hours and the other for closer to 2 hours. Both sets of loaves were very nice, but the 2-hour rise resulted in fuller loaves with a chewier crumb. It would be helpful to have weights for all of the ingredients, as in the biga recipe. It was very satisfying to make this recipe and the results boosted my confidence in baking yeast breads. I really love this recipe. I love the ritual of bread making, and this recipe has it all. The final product has a dusty, crisp crust and a soft, delicious crumb. Try not to knock the air out as you transfer the loaves to the stone and you will be rewarded with those fabulous holes which make this great bread interesting! Already had The Italian Baker cookbook from years ago, and I am so happy to have kept it. 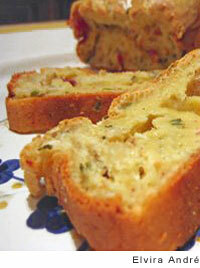 I have made some sweet breads using its sponge which were just wonderful. This recipe sure didn’t disappoint, either. I made the biga, which was a snap, and left it to bubble and triple. I refrigerated it until the next morning and used all but a little bit, which I put into another recipe. It’s a really soft, sticky dough, so I put it on parchment and let it rise. I have a pizza stone, and when it was time to bake it does work to slide it off onto the stone. I put ice cubes on the bottom of the oven to create steam instead of misting the loaves. They baked up to a really nice chewy golden brown. This is a wonderful recipe, and I’m sure we can make some wonderful sandwiches out of these. First, though, I’m going to share with my daughter. Love it!!! Ciabatta Recipe © 2011 Carol Field. Photo © 2011 Ed Anderson. All rights reserved. All recipes and photos used with permission of the publisher. I have the first version of the book. I love it. I have made this recipe before. The dough is really wet. Hard to form into a loaf. Fun to make though. Have been thinking about making it for a while now. Haven’t made it in years. This is big inspiration. Hmmm…wonder what I am baking on Sunday??? This, of course! I am trying this recipe for the first time. I decided my 1% milk probably could use more fat so I substituted some half and half. Fortunately, I followed the directions and the yeast didn’t proof. Who knew half and half kills yeast? Hi Jeffrey, the additional fat in the half and half is probably the culprit. The milk fat can coat the yeast cells slowing down or inhibiting their bloom. Beth thanks for the reply. When I went to make the loaves I cut the dough in half and froze half of it. The other half I cut and formed two loaves. I tried spraying the oven (I had a cast iron pan I sprayed into) but It brought the temperature down to 375, so I sprayed less and faster but couldn’t get the dark brown crust even cooking them 25 min. Couple questions? How do I get that deep brown crust? Is it temperature? . Second, can I take my frozen dough, defrost it and then just try again, or did I mess up the dough by freezing it. Hi Jeffrey, I haven’t tried freezing this particular dough. Most doughs are fine to freeze so I would give it try- please report back and let us know. As far as the color of the finished loaf, I would first check the accuracy of your oven with an oven thermometer. Did your finished loaves shrink back or collapse at all? If so, they might have needed a bit more time in the oven. The loaf didn’t rise as much as I would have liked came out more flat and wide then risen, although tasted good. I didn’t try and flip the loaf onto the pizza stone but just put it on with the parchment paper. I think it may not have browned and risen correctly because I sprayed the loaves with water before putting them in. When I defrost the other loaves I’ll let you know. Thanks for your help. Please let us know, Jeffrey. I’m curious how the frozen dough will react. Hi, it’s a great Ciabatta! Did I do something wrong that my crust is quite hard? Delena, has the crust softened at all? I find that my breads’ crusts soften a bit when they cool completely. I have a tip about handling the dough. I don’t know if this is a legitimate method, but it works for me. I keep one hand clean and hold a large scraper in it. The other hand I just let get hopelessly doughy and i just go back and forth, scraping up smeared dough with one hand and smooshing it into itself with the other. If too much dough gets on my hand I use the scraper to get it off, and I use my hand to keep the scraper mostly clean. It’s a glorious mess that would make any preschool teacher proud, but it works pretty well. I actually made the whole batch by hand (no mixer) and totally avoided the overly floured effect, so I would guess my method is okay. We are just munching on our bread now. This recipe really worked well. My loaves cooked in 18 minutes and I had no issues with the paper sticking, though I used flour and semolina on the paper. Thanks for a great recipe. Vic, you are so welcome. Lovely to hear. Hi Renee — I’ve had luck with the texture — nice and hole-y inside and crusty outside — but I”m not so happy with the taste of the crumb. I’m wondering what brand of flour you would recommend — and whether you’ve ever used some other flours — barley or rye?? Fantastic recipe–particularly the final proof on baking paper/flip over technique. Made four loaves in our wood-fired oven and all gone within 24 hours. Only question I have is that the loaves (while delicious) didn’t really have the large holes and really chewy, chewy texture I would associate with ciabatta. I’ve seen other recipes that have a higher moisture content than this one. Any suggestions? I am making this recipe for Ciabatta loaf for the very first time tomorrow Saturday morning. Thought I would make a half recipe first to test and experiment and to familiarize myself with the procedure and art of making it. My question now is with the proving time if doing a half recipe, do you still follow the same hours as stated in the recipe? Would appreciate your help on this. Thanks muchly. Angelina, we’ve found that with many bread recipes–including this one–the type and amount of flour can make a substantial difference in the resulting texture. I believe you’re baking in Australia, yes? We’ve run into this issue before with the difference in brands of flours. Baking can be such a science, and as noted in the response to Nick just above, any slight tweak to the ratio of flour to water can wreak havoc with the holiness, so to speak, of the ciabatta. This dough tends to be a little sticky, so I’m wondering, is there a chance that you added a little more flour to compensate? And do tell, how was the taste and texture? Yes, I am from Australia. And I use the organic unbleached all purpose four. I followed the recipe and no, I did not add more flour and followed what was in the recipe. Thank you so much for your help. I will keep you posted. Cheers!!! Thanks for your response, Angelina. I didn’t mean to implicate you, I just had to ask, as often we receive messages from readers saying “You know, this cake wasn’t as rich as you said it would be…” and then it turns out they substituted skim milk for the whole milk and used only egg whites and snuck in applesauce in place of butter…but it’s lovely to hear that you are undeterred. I’m nudging one of our most experienced bakers with your query, as I know she’s made this recipe time and again, and will get back to you with her response. In the meantime, I am so relieved to hear that you are both undeterred and sated from a slice (or three) at lunch. I have the loaves resting right now before they go in the oven. I made the biga with water, but used whey instead of water when mixing together the actual dough; hopefully the higher protein content will help it to form a strong internal structure to hold all those awesome bubbles in. I have to say, every time I’ve tried to make ciabatta, the big holes have all been at the top, so I find the idea of flipping them right before baking really attractive! One question. This recipe was not unusually messy EXCEPT for the part where I needed to get the dough onto my work surface and knead for a couple of minutes. I covered everything with a ridiculous amount of flour, but still my hands ended up a sticky mess PLUS the dough was really too slack to be able to “knead” by hand anyway (it ended up being repeated “folding”). What is the benefit of the step where the bread is kneaded by hand? Is it to incorporate a small amount of flour? I’ll post again after baking! Steve, we’ll be standing by to hear how it went! Clever thinking on the whey, curious to learn what effect that wrought. In the meantime, we’re reaching out to our resident baking experts to answer your query about the kneading…. The bread turned out fabuloso. I’m not experienced with baking directly on a stone, so I inverted the loaves onto parchment before sliding the parchment onto the stone. I made the recipe-specified four loaves, and they came out of the oven less than 24 hours ago. We now have about 1 1/2 loaves left, after a whole bunch was consumed by snacking and an entire loaf went to pan bagna last night. I will be making this regularly. Oh, and just so that I’ve said it: massive holes all over the place. Something came out of *my* oven that has those cobweb-looking strands of bread that go across the huge holes! I’ve only ever seen those come out of commercial ovens, from professional bakers. It’s a pretty awesome feeling to know that now I can make ciabatta for around $0.40 per loaf that my wife and I both agree tops the store-bought stuff at $3.50 per loaf. Wonderful, Steve! Just wonderful. And while there’s a lot to be said for a reliable recipe, Steve, there’s also much to be said for the deft touch of the baker, especially when we’re talking about bread. Steve, words can’t convey just how relieved and triumphant we feel right now on your behalf! We’re also feeling rather impressed and amused by you having such una buona forchetta, that is, a good appetite, for those loaves. And rightly so—you earned every single memorable mouthful of that bread. You are quite, quite welcome. My biga for this recipe came out very nice. I had 540g so I just put it all in the bowl since it was such a small amount over. In adding the yeast to the milk it did not want to foam up like it does in water so I added a teaspoon of sugar to help it. This yeast comes from a large batch kept in the freezer and worked perfectly just last week. It doesn’t expire for a year. My dough was extremely wet, not really anything you could knead by hand. So I used my bench scraper and did the best I could without adding too much flour. The first rise was great and I had a nice bubbly dough. I shaped 2 loves and 12 squares to use as buns. I just flattened the dough into a square and cut them and moved them to parchment. Again this dough was more like a large sticky mass. Nothing you could actually knead into any kind of shape. After 2 hours I baked my breads. The first one that I flipped over lost all its shape and baked up as a flat bread. The remainder I just baked on their parchment. None of them rose anymore once they were in the oven. They taste good but are really extremely flat. We love ciabatta and I would make it all the time if I could perfect it. My other breads come out really nice. Hi Sharon, I asked our baking expert about your questions and she offered several suggestions. First, for many bread recipes the excess amount of starter wouldn’t matter much. Here it may very well make a difference for two reasons. First, this is a very wet dough and a little extra hydration (the biga being even wetter, at about 79%, than the finished dough, at about 73%) may slacken the dough too much. Second the difference may be more than it seems. The biga recipe should yield 590 grams, as opposed to 540 grams. If the proportions of flour were off, then the biga was even more hydrated than it should have been. The amount of water in the dough does make it harder to handle. It also makes it require less kneading. It does, however, require some kneading to develop enough structure to trap air on both the first and second fermentations. The shaping involves a little rolling too which helps with structure. Pouring the dough out and cutting it wouldn’t form any sort of “gluten cloak” to help contain the air bubbles. It sounds from this description that the dough may have been deflated when shaped. They ARE pretty flat and the second rise doesn’t get them to double, but they should be puffy; it should be obvious there’s air trapped within. Hi! If you wanna make it by hand you have to knead it by using a bench scraper and smearing it with a slight wiggling motion on your counter. Then you scrape it into a ball and do it again. It works really well, you begin to see the threads of gluten forming. I actually prefer it to regular kneading…maybe it takes me back to being a little kid and playing with messy things! As with most things that are new to us, making ciabatta takes a little practice. But I am so glad to hear you persisted and didn’t add a ton of flour, which would have totally ruined your resulting bread. Thanks so much for taking the time to chime in, amy. The directions say to mix the biga, water, and oil all at the same time in the stand mixer. Well, I have a normal/small sized mixer and ran into a problem. Even on the lowest speed, water was flying out of the bowl due to the biga sloshing it around. So I had to pour it all out and add it in slowly, which is what my intuition told me. How did it turn out, Drew? So, I followed the instructions exactly, and ended up with a very elastic dough that turned into a somewhat dense bread that produced few holes and didn’t brown. Any ideas what went wrong? Hi Rachel, it sounds like maybe a tad too much flour was incorporated during the kneading process. The dough should be wet and a bit sloppy, definitely not your normal bread dough. The only time that this bread turned out unacceptably dense for me was when I was making it with sourdough (instead of baker’s yeast) and I allowed it to overproof for one of the steps. Since the yeast wasn’t vigorous enough during the final rise, it couldn’t produce enough gas inside the dough to puff up very much. It ended up an absolute brick. If you’re using baker’s yeast, the same thing can happen if you allow it to overproof. Also, transferring the loaves to the stone without degassing them too much is really tough. I don’t “invert” them off parchment paper like the recipe says——frankly, I don’t understand how that’s even done. I let them do the final rise in a quickbread pan that’s LOADED with semolina to prevent sticking, and then turn them out of that onto the preheated stone (likewise loaded with semolina). That’s the way I’ve found that gets them onto the stone with the least disturbance for the bubbles. If you’re transferring them to the stone with too much force, it could affect the openness of the crumb. Steve, many thanks for the tremendously helpful insights. Greatly appreciate you taking the time and trouble to share. Love benefitting from everyone’s shared experience here…. Is it possible to refrigerate 2 of the loaves after step 3 ? I would like to bake 2 today and the remaining tomorrow. Hi Druz, this dough should be fine in the refrigerator. I tried this recipe, but halved the proportions in two as we are now only two at home. I made the biga yesterday night and the dough this morning before going to work. All went quite as described but though the dough was very sticky as I took it out of my food processor, it was no more after the kneading (I didn’t add any flour, just powdered my table). I put it in the fridge (as I have no time in the morning to let it proof and bake it before leaving for my office). When I got back home at the end of the afternoon, I took it out of the fridge, shaped it (as I could) and let it proof again. It didn’t rise a lot but when I put it in my oven, it rose very much (too much I think). The bread is good but has nothing to do with your picture as the crumb is tight with very small holes. Hi Vice-Versa, I spoke with Cindi, one of our professional bakers. She thinks that the retarding (refrigeration) and second proofing may have allowed for extra fermentation, some escape of gasses, and the decrease in the size of the air pockets. This is a slack dough and if all the factors don’t come together the texture will be different. Not bad, but like the you indicated, a tighter crumb. Thank you for this. Just hours after looking. So does the milk make it authentic? Hi “info”, the authenticity comes from the biga starter and resultant very wet dough. Let us know if you try it! I would love to try out this recipe but i have no idea how to prepare the biga starter, please help.Thanks. Hi Edwina, you can click on “biga” in the ingredient list to go right to the recipe. Or copy and paste this link into your browser: https://leitesculinaria.com/79243/recipes-biga.html. If you follow the recipe exactly as written, you should have a lovely loaf of bread. Let us know! My biga proofed for 23 hours instead of 12. Am I still good to go? “I brought home some of our dough from school and it sat in the frig, basically proofing, for a day and a half. It was still good bread, but it did not have the classic ciabatta open crumb. The yeast in a dough can, after a time (depending on the composition of the dough) exhaust all its food and become inactive. Plus, with such a slack dough there is some escape of the gasses produced. Plus plus, the alcohol produced as well as some CO2, again especially in the presence of all the water here, can dissolve making the dough a bit acidic, further weakening the structure. So basically, dough is alive. And like all living things it’s complicated. Time, temperature of the proofing, activity of yeast all matter. It’s one of the reasons I find bread so fascinating. No matter what, it really is never the same thing twice. Not exactly. Maybe you can view that as a challenge, but I like to think of it as a reward. I went ahead and made it yesterday and yes, the crumb was tight and without many holes. It didn’t brown, either. I was careful not to add more flour when kneading, just a throw of flour for the board. It did taste really good, just NOT what I wanted. Thanks for the info! thetuscanheart, I’m so sorry to hear that it was disappointing to you. I’ll ask our bread baking expert if she has any other suggestions…. Hi so I just finished the bread and it came out good and a nice hard crust, I followed your recipe virtually perfect.. But my bread was not “hole-y” and it did not have big air holes in it. It was too dense…. Does this mean I added too much flour? Hi Tyler, that is a possibility as the dough is very wet and sometimes too much flour is added in the attempt to make it easier to work with. How much additional flour do you think that you added? Well i read other comments with the same issue so i realllllly tried hard not to add any… After the second rise on the parchment paper, is it wrong to move or touch the bread anymore?? Hi Tyler, it is possible that too much movement could cause the dough to degass a bit. There were helpful hints by Steve on this subject in the comment section. Have you seen those? 1. As you implied, the big, impressive holes in the final product are the result of the fermentation that’s happening in the final stages, so if you handle the dough too much it will let go of a lot of gas and not puff up quite as much. 2. Are you baking on a stone? That can really help with oven spring. (If you’re getting problems with the bottom of your crumb being “soggy,” buy some semolina and go parchment-free – live dangerously!) You must preheat the stone for a long time at a high temperature, though. I generally preheat mine at least 450° for at least 30 minutes before even thinking about putting bread on it. 3. If you’re really struggling with getting holes, try adding a couple of tablespoons of vital wheat gluten to your dry ingredients. It makes the dough more cohesive and helps it to trap gas. 4. I make my own yogurt and strain the whey off, so I sometimes have whey sitting around in my kitchen. As I wrote in one of my comments above, I’ve made this bread with whey substituted for water in the final mix (not in the biga). Whey is loaded with protein, which (again) helps with cohesion. 5. About whether you’re adding too much flour… How are you measuring your flour? If you measure by weight, you’ll get the same amount of flour every time. If you measure by volume, you may get more or less flour based on settling of the flour. You can take measures to counteract this settling (go to http://www.kingarthurflour.com/recipe/measuring-flour.html), but REALLY the best way to measure your flour is to use a kitchen scale and figure exactly 4 1/4 ounces of weight per cup of flour in the recipe. I mentioned that last one because a lot of the time bakers will measure out flour by volume, thinking that they are using the amount of flour specified in the recipe – when in fact they are using significantly more, since the flour they are using is more dense than the measurements are intended for. Best of luck. Even with the excellent directions on this site, this is still a challenging recipe. Steve, wonderful advice, thank you! Wow thank you guys so much. You both truly are masters at what you do. I do have a stone so that’s a plus. So if I weigh it out, don’t mess with it at all in the final fermentation stages and be sure I do not add any flour, I think ill be good to go.. Wonderful advice, Steve! Thanks so much for jumping into this conversation. So, Tyler- how did the second batch turn out? Ok so round two, still no big holes. Here’s what I did. I weighed out the flour so there would be none extra. I used a baking stone. I did not touch the bread during final rise, so I would not degas anything. I made 100% sure that I added zero flour while working the dough. So I’m kind of confused here. Could quality of flour prevent this? I use “King Auther” flour, is this not a good brand? Does preheating the baking stone really make a difference as far as getting the big holes? The only other thing I can think of would be to add some type of protein to promote better gas. But I feel as if I’m still doing something wrong. At long last it looks like I have found a Ciabatta recipe that looks like the real thing. Can you help me with a yeast issue. In your recipes, you use “active dry yeast”? I prefer using live yeast blocks. How does the conversion work to suit your recipes? Hi Wayne, our testers made the recipe with active dry yeast. Usually, it is a multiplier of 3 to switch between active dry and fresh yeast. The website for Red Star Yeast also has a conversion table based on flour amounts. If you try the ciabatta with fresh yeast, please let us know what amount worked for you. I’ve got the 4 loaves rising by the fire, oven is preheating as I type…I’m so hoping that I get nice big holes! Fingers crossed. Very happy with how the ciabatta turned out. My wife and I ate a loaf straight out of the oven :) The taste and the chewy texture was fantastic, but it wasn’t quite as holey as I was hoping for (there were holes, just not as many as the pic at the top of the page). There seems to be a trade-off between a wet dough and lots of holes vs. having a slightly drying dough that’s easier to handle but with not so many holes. Hey, that’s fantastic, John! And yes, a very astute observation, there is absolutely a correlation between the stickiness of the dough and the number of holes. But taste wise, as you found, it makes no difference. Am so happy that you had a terrific breadmaking experience! Ok, an update…the 2nd loaf was perfect. Looked just like the loaf in the photo!! We all have our learning curves…and sometimes, especially with baking, we find there just seems to be a little magic at play. Again, so swell to hear things went so well! I have never heard of biga, what is it please? Or what can I use instead if it is not available in New Zealand? Hi Diane, biga is just a starter. You can find the recipe here. Do I have to use all the dough to make loaves or can I save half for my next biga? If no stand mixer or food processor can you put the ingredients in a bread machine in the same way as the stand mixer and use the “dough” setting? It seems it might work the same. 2 min. 1st knead, 28 2nd 10 min. first rise, 10 sec. punch down, 50 min. second rise total 1 hr. 30 min. What do you think? Hi Tam, to be perfectly honest, we didn’t test it using a bread machine. This can be a tricky dough. My best advice, give it a try and see how it goes. And please let us know. I just made your recipe, this is the first time my ciabatta was good. The first two loaves today I put in on the stone with the parchment paper still under the loaves, the second I flipped them over. Results were the parchment paper down rose higher, the flipped ones rose less but had better open holes. Great recipe! I should share what an older Italian gentleman told me about wet doughs; when working wet don’t use flour to keep it from sticking, wet your hands and work surface. Worked like a charm, and when I formed the cylinders I wasn’t afraid to use flour. What wonderful advice, mi collectorchael! Some of our readers have yearned for those open holes and have probably been reluctant to try flipping the loaves. Love that you did it both ways and shared your results. Thank you! I just tried this recipe today and because of living at 4500 ft above sea level I cut the yeast in half which is what I usually do when making bread. I used the full amount of yeast for the biga. Unfortunately I did not get much rise in the oven with little or few holes. Other than the change in the yeast I followed the recipe exactly being careful not to add too much flour. I would appreciate any thoughts you may have on this. Jackie, I’m really sorry to hear you had an issue with this recipe. In our experience, ciabatta is tricky enough to make even when all circumstances are ideal, and so I suspect that the high-altitude adjustments, though well-intentioned and clearly appropriate for most recipes, may have sorta freaked this loaf out a little. Unfortunately none of our testers who made this loaf live at your altitude. So instead, may I recommend the book Pie In The Sky by Susan G. Purdy? It’s a terrific, terrific resource on baking at high altitudes, and I know several home bakers who swear by it. I don’t know for a fact that she covers wet doughs in the book, but perhaps it’s worth a try? Just tried the recipe it came out good but not as many bubbles. I used the biga recipe that is on your website (the one the uses 2 and 1/3 cup flour, total water 1 cup plus 4 teaspoons and 1/4 teaspoon yeast) I measured everything and weighed everything, any ideas? Hi Mike, so sorry to hear of your un-holy bread. This is a very wet dough and the usual tendency is to add too much flour and possibly over knead it. They are some great suggestions from one of our readers, Steve, in the comments that offer some tips to get those bigger holes. Have a look and see if that helps. What does ‘rested’ biga mean? Left at room temp? Hi Barbara, have a look at the Biga recipe. The author gives some tips on using and storing the biga. Beth, thanks, but I”m still unclear — the ciabatta recipe says “2 very full cups (17.5 ounces/500 grams) biga, rested for 12 hours” — what does the ‘rested’ mean here?? Left at room temp after refrigerated or left to rise for 12 hours? Hi Mary, the biga is rested and ready to use after step 3. Carol suggests 12 hours but you could let it rest much longer depending on how much flavor you would like to develop. Hi, I like your site, thank you very much. I know my dear mother’s method for how to deal with wet dough, and it helped me to get nice 4 ciabatta. Just roll the dough in dish full with flour. Regards. Thanks for the tip, Mixchicmix. I tried this and think that the instructions were quite easy to follow. At least up to the point where I have no clue why my version does not have the chewy, resilient feel to it as it should. Maybe this is because I don’t have a stand mixer but used hand held mixer instead? Or maybe because I lack the baking stones? I also used some whole-wheat flour because we are not used to “white bread” here. And baked buns instead of loafs. So there were lots of variation to my version, i quess. Anyway I had the air bubbles and nice crust the crumb just was soft. Hi Kati, it does sound like you may have introduced too many variations at once. I would try it again exactly as written and once perfected, then you can add in your own touches. I’m interested in this bread because I’ve tried several commercial ‘ciabattas’ from our local grocery stores, and I think I can do better. One problem, however. I don’t use mixers or processors for baking (except cheesecake). I much prefer bowl/wooden-spoon/hand kneading, which yields great results on most breads and gives the added satisfaction of having done it in an authentic manner (like Grandma). So, any tips before I launch into ciabatta? Sure John, just remember that this is a very wet dough so resist the temptation to add more flour. You might want to read through the comments to see other tips that our testers have suggested. I don’t know if I skipped over this, but does the fat content in the milk matter? I generally buy 0%-2% milk fat milks. I almost can answer my own question. I would love to begin the biga tonight and bake the bread tomorrow evening, but alas only 0% milk rests in my refrigerator and I just spent all of my grocery budget this afternoon without much thought to baking needs. Thanks for answering. Hi Sherry, great question! Usually most baking recipes assume full fat milk as that extra fat helps in the tenderness of the final baked good. With the ciabatta, the protein in the milk helps in the internal structure. We sure are curious about the 0% milk. Please report back and let us know. I am excited to try and make this bread! My sons have developed a taste for ciabatta rolls for their sandwiches. They are very expensive and I want to make my own. Can you further divide the dough and bake without changing the texture and “ciabatta-ness” of the bread? Is there a way to make it dairy free? I see from previous comments that the milk protein is needed to create the brand’s structure. Would almond or soy protein work? You could certainly make smaller loaves, Jackaroomom, but I’d be reluctant to substitute for the milk as that might affect the ciabatta-ness that you are looking for. Good luck! Love the bread, but in order to get the best result, can you please list all ingredients in milliliters, grams, as measuring is different in different countries. Ex. our tablespoon is 20 ml and yours is 15. Hope you can assist. Sheri, Alice Springs NT Australia. Hi Sheri, we understand your frustration. Most of our recipes are from US authors so they are written with a view to the US audience. We are trying to add in conversions, especially with the newer recipes. In the meantime, this chart might help. Please let us know the results of your experimentation, Sheri. We’re curious. Had another go today, nice result. We are now using a flour with a protein of around 10, rather then the higher protein we used before. Each time the bread is delicious regardless of number of holes. Today bread has plenty of regular shaped holes, but not big ones. The texture is divine…dipping in garlic infused olive oil and some dukkah. Heaven! I have purchased a hard copy of Carol’s book and intend to try many other kinds of breads. I think this blog is a great support to people learning the art of bread, so thanks to all . So very happy to hear, Sheri. Thank you! I wanted to know if I can use water instead of milk? If yes how much water should I use? Hi Rafi, I would stick with milk in this recipe. This is a great recipe. I have tried ciabatta before with marginal success. One thing I adapted (because I was to lazy to go the store) was the milk. I don’t drink a lot of milk and had some half & half cream for a pasta dish I am making tonight. I used the cream (4 parts) and water (1 part) and this bread is amazing. Could be my new favourite. Thanks for posting. You’re more than welcome, Christopher. Some people have found it to be a daunting recipe–I so happy you like it. I’m making Ciabatta for the first time and have followed this recipe, it was incredibly easy to complete and I loved the silky feeling of the dough. I’ve shaped and am waiting for the final rise prior to putting it into the oven. I have to say though the tip to always weigh your ingredients is absolutely key!! I sifted my flour first and then measured by volume to see how much of a difference it was to the weight… 1 cup too much by volume, I couldn’t believe it. I don’t have a kitchen scale mind you, I used my 5 month old sons baby scale (whatever works lol). With the ease of use of this recipe and no doubt incredible flavour I will definitely be using again. Thank you. Love that ingenuity, Brenda! Thanks so much for taking the time to share that, I’m quite certain there are many others who will appreciate and benefit from it. It turned out fantastic, delicious flavour and perfect snap to the crust, the way a good bread should be (though I don’t know how you can fully cool these without slicing in for a sample). I will be making again for sure except I will only cut into two pieces and not stretch out as much, you get a natural additional stretch if you’re flipping onto your baking stone anyway and I’m hoping it’ll allow for a little more height. Lovely to hear it, Brenda. And your tricks and tactics for next time sound perfect. We so appreciate you taking a moment to let us know how much you like this loaf. When this recipe was up, I confess I experienced moments of real panic trying to deal with my first wet dough experience (I was only 16 or 17 years old although I had been baking bread for almost 10 years). But I persevered, and Carol managed to talk me down with all her good instructions and tips. Great bread and great baking throughout the book. I learned good old-fashioned “American” baking from my grandmother, French from Julia Child, and Italian from Carol Field and my mother (she was an amazing cook and baker but, like many busy people, she knew how to delegate.) So happy to see you have highlighted this recipe here. It’s so good to see you carry on so many baking traditions, ruthie. Carol is a gem. Do you think you could make rolls instead of loaves? If you can how would you go about it? Hi Maryann, this can be a tricky dough if you are unfamiliar with a wet dough. I would suggest working with the loaf first (as the author gives such great guidance) to get a feel for it then trying other shapes. Once I get the biga going, why do I need the teaspoon of commercial yeast? Can I substitute another wad of my own nicely growing yeast? I keep a basic starter going. If so, what suggestions would you have for adjusting the recipe…if any? Of course you can use your own starter. You could probably substitute your starter for the biga if you so desired. This dough, as with all ciabatta dough, should be VERY wet so,assuming your starter is wet,it should work nicely. Okay. So in the recipe above, I’d scuttle the tsp of instant dry yeast and the 5 Tbl warm milk, increasing the room temperature water to 1 1/2 c and letting the biga do all the work. Tom, please let us know how it turns out. I will. Here’s an interim report. At about 12:30 pm today it seems to be working well. Tom, it’s looking good!! Please keep me posted. Yup. It sure looked like a great start. But the results were disastrous. My wife said “What happened?” I replied that a lot of stuff happened. The worst thing was that I’d not been attending to the starter properly and it punished me. The yeast pretty much let the bacteria take over. Acidic sourness took over. The loaves were ugly, too, and not in the “homely but attractive” ciabatta way. As I said, there was more but I’d rather not go into it in public. I believe that I gained much understanding and can do a lot better next time. For now, I’m reviving the starter and will go back to the boule (which is about 70 percent hydration so wet dough is my friend) at least once before doing the ciabatta shuffle again. So sorry to hear, Tom. But you seem undaunted, so back into the saddle, sir. Hi it’s my first time with a biga and this recipe.. and I’m a bit grumpy at the moment. I measured out 500 g of flour which ended up being 3 cups not 3 and 3/4 cups. I followed recipe exactly… but my dough is too wet! It is more like the biga than dough, in fact I think it’s more wet than my biga. I should have gone with the other 3/4, although i think even that would not have been enough flour. It now it’s risen the 1 and 1/4 hours. I made the mistake of doing the recipe before watching the video. I see now how wet the dough is supposed to be, I read that the dough would be rather wet, almost too wet to handle so I just went with it. Whereas in retrospect, mine was ACTUALLY too wet to handle! I’m going to try mixing more flour in and having another rise, which i hope won’t negatively affect the taste or structure. This has been quite a frustrating experience thus far….at least I’m learning. This had better be tasty! olive, yes, the recipe is challenging. And I hope you have better success the next time. Please write back and let me know. I love bread. I love the time it tales to make bread. When I get stressed out, I make bread. This recipe for ciabatta was the best I have ever used. The loaves were crispy on the outside, the inside a beautiful array of open spaces and luscious bread knitted together to hold the butter. Thank you for hosting this site and providing the directions. Time to make more bread. Paul, thank you for taking the time to let us know. Yours is exactly the response we gun for with each and every recipe that we carefully test and tweak and edit prior to posting it on the site, and hearing from you makes it all worthwhile. So pleased to hear this is your go-to recipe. And I couldn’t agree more with regard to the pleasure of taking one’s time to bake bread. Thanks so much for the lovely feedback, Paul. Bread is always the answer for my stress too (er, probably eating it more than making it, if I’m being honest). So glad you enjoyed this recipe, and looking forward to hearing more about your baking adventures! Great recipe, I used it a few times and this time I added about 1/4 cup more water and my holes are getting a bit bigger than before, I live in Calgary where it is pretty dry. Would it safe to assume that to try to get bigger holes I should keep trying to add a little more water next time, I think I remember watching something from Alton Brown who I also love and he said that higher moisture content helps make bigger holes? The only other thing is I can’t seem to get a super crispy crust, it stays relatively soft, any tips? The bread is not where I would consider perfect, but it still turns out really good and I can eat a whole loaf in no time all by myself. and use an oven thermometer to double check. Use a baking or pizza stone to disperse the heat. Do not leave out the salt as it helps in forming a crust and use as little flour as possible when shaping as it can interfere with crust formation. And finally steam the loaves only during the first 10 minutes. If you steam later in the baking process it will affect the crispness of the bread. Hope this helps! Why do most folks who write recipes for this bread say to make a ‘slipper like’ loaf, or into rectangular rolls? Ciabatta mix formed into round rolls make a great alternative to those revoltingly bland objects promulgated as ‘Burger Buns’! jayprime, that’s because “ciabatta” means slipper in Italian, and that’s the classic shape. Just wondering why the biga recipe isn’t formulated so that all the biga can be used and so there’s not 100 grams left over. Thanks. Nice recipe. Glad I tried it! Hi Claudia, the biga usually yields around 580-590 grams. Some readers have experienced a lower yield so it can be nice to have a bit extra (which can always be treated as a stater for future bread recipes). Claudia, it can definitely be because of weighing vs measuring, as well as evaporation, the freshness of the yeast–so many things. When you’re dealing with a living creature, which biga is, it’s hard to be precise-precise! I did that today with the first batch I made. I put the rest of the Biga and added some water and shook it up to dissolve it then I put it in the fridge. I’m not sure how or when to use it but I hate wasting anything!! This was fun to make, and turned out very nice. Just the right amount of holes. I had “hard” unbleached flour (I use for making pizza crust) and it worked out fine. It did not ever seem wet to me, and handled very well. Probably the benefit of the “hard” flour is that it absorbed more of the liquid…shop at a bulk barn (bulk food store). Used skim milk, pizza stone, proofed over 2 bricks on top of my woodstove since the house is cold in Feb. in Canada. No problems flipping from the parchment onto the pizza stone. My biga rested in the fridge an extra 2 days (after 12 hours near the woodstove). Thanks for the great directions & video. Cheers. Marney, how wonderful! This recipe can be tricky for some but it sounds like you mastered it. Thank so much for letting us know. I tried this recipe three times, and it failed all the time. I have this book in my iPad in fact. And I have read it through. It just does not agree with me. However, “Il Fornaio Baking Book: Sweet and Savory Recipes from the Italian Kitchen by Franco Galli” is superb. Its Ciabatta recipe is fantastic. I use the whole-wheat flour biga recipe mixed with water (without adding a tinge of yeast to do it). And it always works for me. Pizzi, thanks for the mention of Galli’s book. These kind of recipes are so personal and finicky. While many people have commented they like this recipe, Galli’s might work for those who have had problems. 2nd time I tried the recipe, and this time simply used AP unbleached flour as suggested. Still in the oven…Question: When misting the oven in the 1st 10 minutes, are you misting the top of the bread, or simply in and around the oven? Thanks again, my first try was most enjoyed! Marney, I’m going to ask those more experienced with this recipe than I to weigh in on this, but from what I’ve gathered over the years you’re seeking to provide moisture to the general oven environment, so just in and around the oven is fine. Curious to hear what you think of the results! I have heard that protease enzymes in milk can inhibit yeast production, and serum proteins can denature gluten. Shouldn’t the milk be scalded before use, to nullify this? Hi Daniel, there is a lot of discussion over the need to scald milk. Most older bread recipes include this step. Modern bakers have found that the milk that is now available has already been heated to a high enough level during the pasteurization process to nullify the potential effects of protease and serum proteins on gluten formation. If you are working with fresh, raw milk then scalding is recommended. I just made this and my family loved it. It was such an easy recipe to follow. The video was helpful too. I didn’t get the big holes but I think i squashed them out when I was shaping the rectangles. I will try again. The crust was crispy and the inside was chewy. I didnt get a strong flavour, so I will try leaving the bigga for longer. Pauline, so glad you liked it. And yes, letting the biga sit longer will help with the holes. This was my second try with Ciabatta, first time with this recipe, and I had the same problem both times. The “damp towel” stuck to the rising loaves. I scraped as much dough as possible off the loaves, covered them with plastic wrap sprayed with a coating, and let them continue to rise. Baked two at a time on my stone. The first 2 turned out very flat. For the second two, I decided not to flip them onto the stone, but slid them onto the stone with paper still on the bottom. These turned out great. It probably helped that they had additional time to rise after being scraped off the towel. So, covering with damp towel was a problem both times. Hi Jane, thanks so much for conveying your thoughts and experiences with ciabatta. I found as well that not inverting the loaf produced a higher rise. As far as the towel sticking, make sure that your towel is finely woven (not textured), cover it with a light dusting of flour and for extra protection, remove it during the last 30 or so minutes of rise time. Congrats, katiecoolady! That is excellent news. Looking forward to hearing more aobut your bread journey. Hello, today was my first time working with this recipe and really no issues, except one, that doesn’t seem to be addressed here. The damp kitchen towels used to cover the loaves during the second rise STUCK costing me lift and gas as I tried as gently as I could to free them. Suggestions? Hi Carolyn, sorry that you had a sticky situation. I have a couple of suggestions. First, check the texture of your towel. Rough terry type towels will grab the bread dough. I find that tightly woven linen-type smooth towels work best. Also, you might try working a bit of flour into your damp towel. If this still doesn’t work, peek at your dough as it rises. When it gets close to touching the towel, remove the towel for that final bit of rise time. I have made your bread several times and it has become one of our favorites. Since I have a bread machine, I have recalculated all ingredients for 4 cups of flour. Your recipe for biga yields slightly more than needed for a batch. In my recipe it is exact. Everything (except yeast, oil, and salt) is by weight. A kitchen scale with a tare feature is helpful. I put biga ingredients into the bread machine and run it on dough setting for about 10 minutes. Then I turn the machine off for 12 – 72 hours. At this point I have a choice to use the bread machine to finish the bread, or make dough and bake the bread in the oven using your instructions. Using the bread machine to finish is quick and easy. No sticky dough to handle. Just add the remaining ingredients and the bread is done in 4 hours. Surprisingly, it is acceptable. The skin is crisper when using butter instead of oil. Using the bread machine to make dough requires the same process as above. Dough is done in 1 hr 40 minutes. Take the dough out, shape the loaf, go through the last rise, and bake. Dmytro, many thanks for sharing your approach, it sounds terrific! Greatly appreciate it and so glad you like this recipe as much as we do! Have tried this recipe several times with varying success. My question is how wet should the inside of the loaf be after baking. Commercial versions seem to be drier. I get fully cooked but rather wet results, less ‘bubbles’ than I would like, good taste and, initally, a crisp crust. Perhaps someone can define what wetness to expect. Thank you. I have found part of the problem. Despite Carol’s recommendation I was using bread flour (protein content 11.7%) Changing to much cheaper all purpose with a protein content of 9.7% seems to have solved the wetness issue. 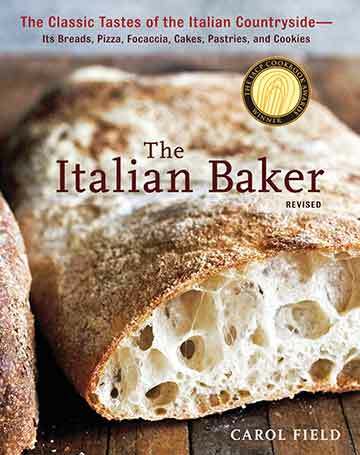 I discovered that early in her book she states that higher protein bread flour should never be used for italian breads. As well, the hole size may be a function of the amount of kneading using a stand mixer. Recipes on the net seem to vary from almost none to 20 minutes. Some more trial and error necessary. Great info Tony! Please keep us posted on all your trials. Yeah I also can not recommend covering the loath with damp towels. They will stick to it like crazy. I tried to cover them heavily in flour before covering. That seems to work. Many thanks, Tim. Excellent tip. 1. Bake a Biga and rise for 24hrs. 2. Then make ciabatta bread dough and refrigerate for another 12 hrs. 3. Keep dough for another 10-11 hrs. at room temperature and then bake. My hubby would like to have home made warm italian bread and wine friday evening and bec’s of working hrs. i can’t really follow rising time. JD, this recipe is finicky. So I can’t guess at any variation because there are so many environmental factors that can contribute to this succeeding…or failing. I’d suggest making it when you do have time to follow the recipe as written. I think you’ll be happier with the results. I will try out this weekend. First batch I am doing today as original recipe calls. I have never used the starter concept so very excited to see how it will come out. So far, biga is perfect and tripled over night. Thanks. JD, that’s terrific to hear about your biga! We’re looking forward to hearing how everything goes…! Many thanks for taking the time to let us know. The bread came out very nice…my Hubby’s response was “Did you buy it from an Italian bakery”! it was that nice and rustic looking as well as tasting good. I would like to share one thing, I followed the following youtube video for stretching dough. I have read many articles about making bread but this was THE Best Recipe. Now, I will try out overnight bread based on my schedule and see what happens. Thank you all. Happy Baking! JD, that is fantastic! So lovely to hear it went so well. Not that we’re surprised, as many have also had your experience, but it’s always swell to hear when it exceeds expectations. Thank you for taking the time to let us know. We look forward to hearing which recipe from the site you try next! I really wanted to watch the video but says not available in my area. Is there a place on the internet where it can be viewed in the US? Papa Jer, unfortunately the video of Julia Child and Carol Field that we had previously linked to is no longer available on PBS.org. We’re confident you can make the ciabatta successfully without having seen the video, although it’s a shame we can no longer watch it as it certainly was a lovely and charming lesson. Help please! When making your Biga recipe, your flour is measured at 141.63 grams per cup. When making your Ciabatta recipe, your flour is weighed out at 133.33 grams per cup. Which one is correct? AP flour is actually 125 grams per cup in every other recipe I make, so this is a little confusing to say the least. My Biga is looking like bread dough using your ratio. You’re completely correct—there is a discrepancy between the amount of flour per cup and for that we apologize. We actually left those measures exactly as they were in the book so as to be true to Carol Field’s original recipe. Of course it’s always most reliable in baking to use the weight, not the cup volume, and we stand behind these weights, although for future reference the professional bakers we trust most use 130 grams per cup. I will edit the cup measure in the big recipe to reflect this. Out of curiosity, how did your ciabatta turn out? The biggest trick with this recipe is not adding too much flour when handling the exceptionally wet dough. Hi Renee, thanks for taking the time to check that for me. I made the Ciabatta, it was a little drier than I would have liked but it was still delicious. I always weigh my ingredients so I should have added less flour. I will try this recipe again as my wife seemed to really enjoy it. I sent you a picture of the final result – The Eggplant recipe I sent you was awesome in this bread. Hope to use more recipes from your website. Many thanks for letting us know! Yes, this dough is simply meant to be super wet and needs less flour when handling than one would expect. Would love to know how it goes with the ciabatta next time as well as any other recipes you try. We test each and every recipe in home kitchens prior to sharing them on the site so as to guarantee only spectacular results. Really appreciate you keeping us informed! You can explain the Biga as you do? 500 g are divided 250 250 flour and water as yeast? Luca, we actually have a recipe for biga on the site that we link to from the ingredient list above. But here’s the link again. Kindly let us know how it goes…! Someone mentioned a video, I would love to see it. Second attempt same results, no oven spring with a chewy tight crumb. Smells wonderful, tastes good. I weighed all my ingredients (used a black marker to black out all other measurements). My dough does not seem really wet so I’m wondering if it’s my flour, I’m using Central Milling unbleached organic AP. First and second rise are look good. Will be trying again in two days. Would really like to get this down. Also, I use a kitchen aid stand mixer, any thoughts as to speed variation with this brand. I may trying mixing my hand since using my mixer has had a negative impact when achieving open crumb my sourdough loaf. Carolyn, there was a wonderfully instructive video segment of Carol Field teaching Julia Child to make ciabatta and grissini that PBS had available on its website. Sadly, the video has disappeared. Perhaps it still exists behind a pay wall on the PBS site? At any rate, yes, it could be your flour. I’ve asked one of my colleagues who’s made this loaf many times to weigh in on your experience with some suggestions. And you’re very welcome! Hi Carolyn, I spoke with several of our testers who have made the ciabatta numerous times and they feel like your issue may be a lack of hydration, which can result in a tight crumb. Unlike American bread dough, Italian bread dough is a very wet, slack dough and the initial reaction is to add additional flour to make it more manageable and less tricky to handle. Is it possible that you added flour to make the dough more manageable? The biga should also be very wet. And, if all else fails, try a different brand flour and see if this impacts your results. You might also want to carefully slip the loaves in the oven as opposed to turning them over. This might help with the internal structure. As far as the mixer speed, I would follow the instructions in the recipe and start on low then increase to medium. I mixed by hand yesterday. (My kitchenaid mixer, rather than kneading, beats the dough which has collected in a ball around the hook against the bowl.) I didn’t add any extra flour and continued working the very sticky dough in the bowl with a scraper using this method to knead. Skip forward, I did see oven spring but still no holes. After further research I believe my issue may be that the gluten is under developed. I will try again tomorrow using hand mix with an extended mixing and kneading. And…I’m researching mixers. Thank you for the metric sizing! Will try this soon. You’re very welcome, Eleanor, and I look forward to hearing what you think! subtle delicious sourdough flavor to the finished loaves. Lovely to hear this! You are so very welcome, David! Can I refrigerate the dough after it is broken into loaves and bake them a couple days later? Hi Deana, I would bake them after forming into loaves. My biga is made but I haven’t begun mixing my dough yet. I think I’m missing something in the recipe in the shaping instructions. The instructions essentially say to stretch and flatten the dough into a rectangle after rolling into cylinders then place “seam side down”. I’m confused as to how I’m going to acquire a seam from stretching the dough into a rectangle. Any advice is appreciated! Hi Chelsea, I asked Larry, one of our expert bread bakers and recipe testers, and this is what he had to say. “After cutting into 4 pieces, roll each into a cylinder which will create a seam. Then, stretch into a rectangle (gently so you don’t force the gasses out) and then turn them seam side up, dimple then, cover and rest.” Hope this helps. This will be my first try. Biga is ready to go but just realized, I don’t have any cornmeal, just a cheap box of jiffy corn bread mix for when I’m in a hurry, I know a crime. I don’t have any semolina either, but I do have some milled flax seed, might that work? Like Steve, I am also concerned about flipping it without degassing it, I don’t care about any seam lines, if there is any after I shape it, might I just place the dough on a floured silicone baking sheet and simply slide it off onto the hot stone? Cheryl, first of all, good for you for venturing into homemade ciabatta! I’ve reached out to a couple home bakers who I know have made this bread before and asked them to respond to your questions. We should have an answer for you pronto. Hi Cheryl, I completely understand your concern about flipping the loaves. If you want to slide them off onto the stone, that should be fine. Once you become more comfortable with the recipe and the process, try flipping them. As far as the jiffy corn mix? I would not use it as a substitute for corn meal as it is filled with other ingredients. I have this recipe in the bowl for the initial rise after the first “knead”. I would love to see a picture, for comparison, of that sticky risen dough after I turn it out next. I’m comfortable with most doughs, but this just seems too loose. It barely holds shape enough to not flow off the work surface. When I work with it next to form loaves, how much structure should it have, ie, what height should I expect the dough to be able to sustain when I start to form it? BTW, everything was measured by weight, taring the scale each time. Hi Greg, this is a very wet dough and a bench scraper will be your best friend. Please resist the temptation to add flour to make it more manageable. Since I posted my help request while about to form the loaves, I didn’t expect a response in time. I ended up using just enough bench flour to create loaves via bench scraper and damp fingers. The structure could only support a loaf height of under a half inch and spread more out than up. Baked loaf had spread out more too and was under a max of 1″ high. Nice crisp crust, but lacking in the larger air bubbles a ciabatta would have. Bottom crust was not quite crisp enough, but I blame that on the silpat rising mat I baked on b/c the loaves were just too loose to transfer. Bread itself was is delicious. Will try again with a touch more flour and a longer second rise. Would be happy to entertain any other suggestions. Hi Greg, that extra flour may have contributed to the lack of air bubbles. The dough should be very wet, as it is that moisture that causes the steam and creates the air bubbles. I would not add the extra flour and allow for a bit more time to rise. I am also going to reach out to our testers and see if they have any additional suggestions for you. This is by far the wettest dough that I have ever worked with. I have made it several times as written and ALWAYS question if it will work or not. This bread will be flat and “slipper” shaped. You must be very gentle so as to not force the gases out. Don’t add extra flour, and shape and move the dough as little as possible near the end. Unlike most bread doughs, ciabatta doughs are NOT forgiving, simply because they are so wet and it’s so easy to inadvertently push out the gas that makes the nice holes. It will still be delicious. Don’t be discouraged. Try again. Trust me, you will be handsomely rewarded! I followed the directions and my bread turned out more like flat bread. It was tasty but I think I did something wrong. I let it rise 2 and a half hours by accident because I forgot to heat up the oven. I also used fast rising yeast which later I read is more suitable for bread machines. Boo! This is one of my first attempts at baking bread. I plan to keep practicing. Any advice would be great! Hi Piper, my advice is to carefully read the comments that follow this recipe. This can be a tricky bread to make and many of our top bread testers have offered guidance and tips to novice bread makers like yourself. Be sure to follow the instructions and resist the urge to add flour to this very wet dough. The only thing about this recipe is that you end up eating a whole loaf before you even think about cooking the main course!!!! It is that good. Esp with butter. Lots of butter. Though for tonight it will be olive oil and a 5-year-old aged basalmic vinegar! Hah! Music to my ears, Paul. So lovely to hear you feel the same about this recipe as we do! This recipe was pretty good – the dough was very wet but not as hard to work with as I assumed. For me the breads came came out more like a focaccia than ciabatta, and I barely touched them after mixing to keep as much gas as I could in them. I made the biga with half whole wheat, so maybe that was the culprit. I wonder if a higher initial temp (say 500F) would help achieve a better spring before lowering the heat to 425F. I suspect, as you suggest, that it was the whole wheat flour. An increased density is typically the result when you add the heavier whole wheat flour to a dough that was intended for white flour. Baking is such a tricky science. You’re welcome to continue experimenting, although honestly I don’t know that the increased oven temperature will help the spring if you continue to use whole wheat flour, $(this). Turn the ciabatta dough onto a generously floured surface and cut it into 4 equal portions. Roll each portion into a cylinder, then stretch each cylinder into a rectangle about 10 by 4 inches, pulling with your fingers to get each portion of dough long and wide enough. Where does the seam come in? Are the 10×4 rectangles to be folded? Matt, thanks for reading the recipe so carefully. No, there’s no folding. And you’re right, it doesn’t seem as though there should be a seam by reading the recipe. But our director of recipe testing, who has made this bread repeatedly, assures me that after you stretch the dough there does appear to be a seam—or perhaps wrinkle is a more appropriate term. I’m guessing it’s a carryover from cutting the dough? Many thanks, Chiara! I’m fixing the note above to reflect your input. Greatly appreciate you taking the time to correct us on our Italian! I live in Western Australia and I have used this recipe many times with great success. As a variation I add activated charcoal to make black ciabatta. It really is a favourite at dinner parties. I actually make this black ciabatta for my granddaughter and grandson because they just love it. I make them each a loaf so there’s no arguments. Black ciabatta! Sounds wonderful, Adrian. Hi! I would love to try out this delicious looking recipe, but I want to ask, is it possible to substitute the dairy milk with soy-/rice-/almond milk or just warm water? Thank you! Adina, we haven’t tried it with a dairy substitute, so I can’t say for certain. I suspect you’re going to have some issues because the milk has protein and sugar which may interact with the gluten in the dough in ways that are necessary for the characteristic structure of the ciabatta. If you want to try it, by all means, go ahead, but I’m sorry, we can’t promise what sort of results you’ll have. You may want to instead consider making a dough that naturally doesn’t call for milk, such as this bread that we’ve made literally hundreds of times and loved. Finally tried this recipe….AMAZING! I’m so delighted with this beautiful bread, thank you!! Now I’m wondering how to keep all this delicious bread fresh…I never know how to properly store it. I’m going to freeze three of them, but for the one that’s going to be eaten now, should I keep it in a wax paper bag or a plastic bag? Thanks! Chiara, because the loaf is eaten pretty quickly, I simply store it cut-side down on the cutting board. It keeps the crust crisp and the interior moist. Thanks! We are on Weight Watchers around here, so it won’t go as fast. I made a bag out of parchment paper, seems to be working fairly well! I have adapted your wonderful ciabatta recipe. I used a ciabatta flour mix (wheat flour & durum wheat) from my mill. I tried the half weight of the dough for two breads. Terrific, Hermann! Thanks so much for letting us know. Your pictures didn’t come through, though. Could you email them to me at renee@leitesculinaria.com and I’ll attach them to your comment? I’m not sure if this question has been asked already but in my country we only have instant yeast. What substitutions do I need to do for this recipe to work? Thanks! Tracie, according to the baking experts at King Arthur Flour, yes, you can use instant yeast in place of active dry yeast at a 1:1 ratio. (For more information, see here.) I double-checked this advice with our own bread-baking professional, who had the following to say: When substituting instant yeast I usually use about 75% of the amount by weight given for active dry yeast. For a recipe that makes 2 loaves or 4 small loaves like the ciabatta recipe, this is a very small difference. I wouldn’t go so far as to say a 1:1 substitution is ok across the board when scaling up or down or doing large batches (commercially), but in this case it would be ok. There’s a total of less than 2 grams of yeast—if I’m recalling correctly–and that fraction of a gram difference you’d get doing the math is not measurable on home scales. Plus with that amount the other conditions—the temperature of ingredients and the room, even the mineral content of the water—will make more difference than the change in yeast.” We’d love to know how it goes, Tracie. All you need to make ciabatta is high protein flour (above 12g/100g) water, salt and a bit of yeast and a very hot oven. You dont need to get your hand wet. Mix 700ml water, pinch of salt, half a teaspoon of yeast. Add 800g of flour. Moisten flour. Leave bown inside plastic bag or cover bowl with easyseal or similar. Leave 12 hours at room temperature. Cut how you like it and put in preheated oven at max temp for 20 min. Ah, but you know Italians, Andreas. Each has the best family recipe for everything! Hence the proliferation of different ciabatta recipes. But we greatly appreciate you sharing yours here. This recipe sounds so good and I can’t wait to try it! However, I have a question first…I don’t use dairy and as I know how much baking is a science, I am wondering if it would be possible to substitute any plant-based milk in this recipe? (If so, would there be a certain one that might work best? That is, ones with higher protein content, as in soy, or something?) Would it change the structure/texture of the bread? I am hoping to hear back as I would really love to make this!! I would welcome input from anyone who might have knowledge of this. Thanks in advance! Georgiann, so glad you like the sounds of this ciabatta! I’m a little concerned about substituting a plant-based milk for the cow-based milk simply because baking is such a precise science and the substitution is going to have a different protein content as well as a different sugar level and each of those could throw off your resulting loaves in different, and disappointing ways. I’m going to ask around with some bakers I know and I’ll get back to you if I learn anything that could be of use or interest to you. Georgiann, I have lovely news to share. You can make the ciabatta but rather than use a plant-based milk simply substitute water. Here’s what our professional baker and cooking instructor, Cindi Kruth, explained to me: “Many ciabattas are made without milk. Here, the milk does add a little fat, sugar, and protein. However, the milk in the recipe is less than 5% (I’m speaking of Bakers’ percentages). The amount of protein it adds is only about 3 grams. Most of the protein, and all of the type of protein that contributes to the gluten development, is from the flour. The reader can simply substitute water. The difference in the amount of protein is less than the difference that might be found among various brands of all purpose flour. I would suggest the reader use a fairly strong unbleached all purpose; one containing 11-11.8% protein. I like King Arthur @ 11.7% for this recipe. I also like Hecker’s, which is in that range protein-wise, but I’m not sure it is available everywhere. Although milk helps brown, adds a little protein, a little flavor in this sort of lean yeast dough it’s absence will not cause any structural issues. The resulting bread should still be excellent ciabatta.” Good luck and let us know how it goes! Followed your detailed recipe and the bread turned out really well. Worked the dough with as little flour as possible. Have to work on my technique of flipping dough off parchment paper on to the stone. My husband said this was my best bread ever. Thanks for sharing your great recipe. This recipe is the gold standard on the net (the world?). Thank you for sharing. It is a great advertisement to delve into purchasing your Italian cookbook. Many thanks for sharing. My question is how to modify this recipe to be one of the delicious ciabatta variants that have whole kalamata olives in it (all the rage at least here in the Pacific Northwest). I see you have a no-knead variation, but I was hopeful of one that uses the full gamut of tricks (kneading, rise time, bigas) to maximize flavors like this does. Cook’s has a variant of Italian bread, but not ciabatta. In their recipe the suggest reducing hydration by 5% to combat gumminess, and add some honey to soften the olive taste. Do you have some tips on how to make the perfect olive ciabatta using this recipe? Geoff, many thanks for your kind words. 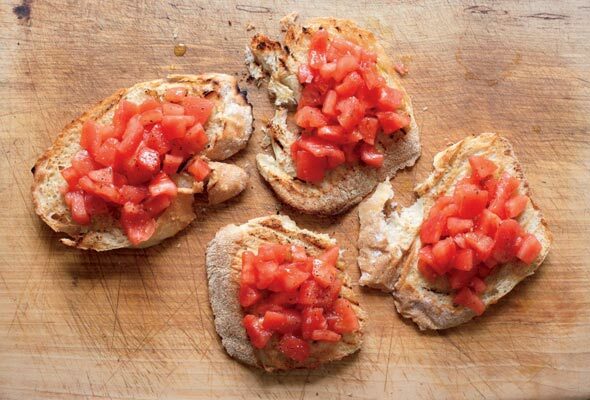 Lovely to learn that you are as smitten with this ciabatta recipe as we are. I asked our resident bread expert, a professional who teaches classes on the topic, and here’s what she says…best of luck! “I haven’t tried ciabatta with olives. IMO it is not the best loaf for additions. Not impossible, though. Even though I prefer my olives on the side, I do add olives sometimes to my other loaves. There’s two ways to do it. “Our reader is right that olives can be wet enough to affect the hydration of the loaf. It’s important to dry them with either method. I squeeze them in cheesecloth although a towel will do. It’s also important not to overdo the amount. My students, most beginners, have a tendency to think more is better when adding extras to baked goods. I’m a “just the right amount is best” advocate myself. You want the flavor and texture of the olives without ruining the flavor and texture of the bread. Choose a good quality flavorful olive and you won’t need to load the dough down. Maybe 4 to 5 ounces for this recipe, at least the first time you try it. Large olives should be chopped. “The first method gives a stronger olive-y taste all through the bread by incorporating the olives at the beginning of the kneading. This is what most beginners do with any addition such as olives, nuts, cheese. Yes, this means a more uniform distribution and the taste of the addition (olives in this case) throughout, but I almost never do it this way because it requires adjustments to hydration (more for dry ingredients, less for wet ones) and, more important, can interfere with gluten development. In the case of ciabatta I recommend the second method only. 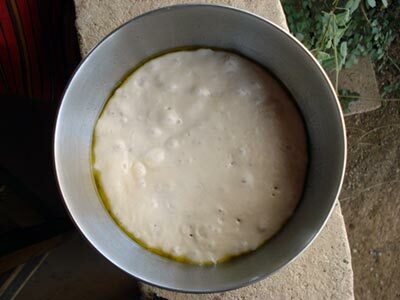 “The second way, my preferred technique, is to add the olives (or nuts, cheese) after the dough has fully developed, that is after it has been kneaded completely. Just knead the olives in by hand before the bench fermentation (first rise). With this method and olives that have been patted or squeezed dry, you should not need to adjust the water. “A problem that arises with additions (using either method above) is that they pop through the dough and whatever bits are exposed to the heat get dried out and hard. Not as big an issue with olives as it is with, say, raisins, but not pleasant when it happens. With a regular country loaf there’s two ways to minimize that. You can simply push the pieces that peek out after shaping back into the dough before setting it to proof. That helps quite a bit. Fussier, but totally effective, is to cut off a piece of plain dough before the addition. I eyeball it at about ¼ of the dough. Add the olives to the larger pieces and shape the loaf. Then roll out the reserved piece to a thin sheet and drape it around the shaped dough, sealing on the bottom. This keeps all the bits inside, entirely preventing pop-throughs. Unfortunately ciabatta is too wet to use to use this second method. “To summarize my long-winded response, I’d suggest 1. Don’t use too many olives. 2. Squeeze them out in cheesecloth or a towel so they aren’t too wet. 3. Add them by hand after kneading the dough completely. 4. Push in any bits that stick out when you shape the loaves. 5. After baking, if there are bits that popped out and are dry, just pick them off the finished loaf (be careful, they’ll be hot). That can make the surface a little craggy, but it isn’t unappealing and it is much better than biting into a singed olive piece. I bought ciabatta bread from the half-price rack at the grocery store. We’re not able do luxuries. (Fixed very low SS income) I had never heard of it before. Don’t know why I splurged. But so glad I did. I’ve tried my hand with hole-y English muffins and while in Bolivia something called marraquetas…both supposed to be holey although mine wasn’t. So I’ve saved this recipe….I’ve read 45 minutes of comments. I do want to try this…with my hope-scale set on high…I’ve only baked regular bread…some white, some whole wheat, some mixed…but just bread. I do not have parchment paper…I was once told to oil typing paper to substitute…never tried it. I do not have a baking stone. Would a cast iron fry pan be a half way substitute? Sally, so glad that you like ciabatta as much as we do! And I’m so glad that you found this recipe and are going to give it a try. As for the substitution, I have used a large cast iron skillet turned upside down many, many times in place of a baking stone and it’s worked admirably. I would recommend you try yours! Although I wouldn’t use the typing paper in place of parchment paper. And as you no doubt saw when you read the comments, this is a very wet dough—much wetter and stickier than most American bread doughs—so don’t be alarmed you’re working with it. Just remember that’s the way it’s supposed to be. Good luck and kindly let us know how it goes! My first attempt at ciabatta and I chose the right recipe :-). I used a wood-fired oven and flipping the parchment would not be easy. So I put the cornmeal on the parchment and flipped the dough seam side down onto that. I just slid the parchment with 2 loaves each onto the hearth. The bottom seemed perfect after only 15 minutes so I moved the bread onto an inverted sheet pan for the rest of the baking time. I think my oven floor was about 600°F and this is a common workaround for high heat. The result was amazing. I did not have ciabatta this good even when I was in Italy. I’ll be making this one again and again. Next time I will make them into sandwich size. Thanks! You’re very welcome, Steve! Magnificent to hear it! Thank you so much for taking the time to let us know. All of us at Leite’s greatly appreciate it! I have a biga currently fermenting away and am ready to make my first ciabatta. I love your recipe and instruction but am wondering if the recipe can be altered to make it vegan (dairy-free)? All the breads I’ve made in the past have just used water as the liquid. Thank you! Stacey, I’d love to help you tweak this ciabatta to make it vegan, but baking is such a precise science, and I really think the moisture and fat contributed to the loaf from the milk is essential. As much as I’d like to have you try this recipe, if you really want to make ciabatta, I’d suggest you try a ciabatta recipe that doesn’t call for dairy as opposed trying to tweak this recipe. Good luck! I’m a little late to the party here, but I wanted to toss in my two cents…for what it’s worth. I have experience with bread baking, and have never found a ciabatta recipe that yielded authentic ciabatta. I made this ciabatta twice. The first time, I followed the recipe to a tee, following the weights instead of the volume. The dough was too wet. I know the dough needs to be sticky, but what I had was barely workable. I trudged on hoping for the best, but the whole time I was thinking that the dough needed more flour, and I should add it. I kept myself from adding more flour. When I shaped the loaves, I found that rolling the cylinder on the work surface was good, but shaping the dough was much easier to do on the parchment paper, as I didn’t need to transfer a flat piece of very loose dough over to another location. The cylinder was much easier to handle. I used a baking stone and baked the loaves for 20 minutes.They came out decent, but were very flat, and slightly dried out. I should have cut down on the baking time because the loaves were so flat. The taste however, was great. The second time I made these, I followed the recipe, but substituted bread flour for the AP. I figured the higher protein content would absorb more of the water. Once again, I ended up with very wet dough. This time I added more flour…approximately half a cup, until the dough just began pulling away from the sides of the bowl with the dough hook attachment on my stand-up mixer. I turned the dough out onto my work surface, and let it pull in enough flour until it felt right…slightly sticky on my hands while I was kneading, and sticky once my fingers broke through the floured surface. I formed the loaves shaping them on the parchment paper, and let them rise. They were much puffier this time, and looked like ciabatta. The proof was in the pudding when I cut into it. It was literally perfect. Nearly identical to the picture at the top. My crust was slightly less browned, but the bread was incredible. Darryl, love your spirit of innovation and thanks for sharing your results here. May I inquire which brand(s) of flours you used? Just curious. As for the discrepancy between weight and volume, yes, we were surprised to see that, too, when we first encountered this recipe. Most of the time when we test recipes we adjust the volume measures so they are aligned with commonly accepted equivalents, however, in this recipe we left the measures as they were in the original cookbook because of the author’s advice on how to weigh the flour (see the troubleshooting tips just above the recipe). We’re big proponents of weight measures for baking, but we suspect that when you use her method, the volumes do equal her weights. We’re going to try to recreate what you experienced and if we can make that happen we’ll include mention of that in the recipe. Again, thank you!